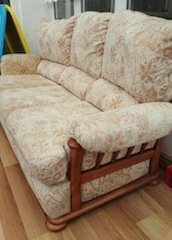 A three seater high back sofa on a solid wood base, upholstered in floral patterned canvas. 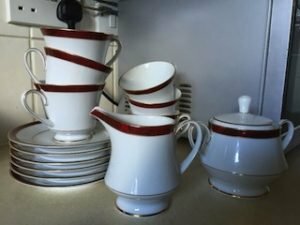 A Noritake bone China os blood red and gold decorated tea set, to include a milk jug, a lidded sugar bowl, six teacups and six saucers. 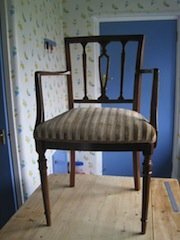 A vintage solid wood high back hall chair, upholstered to the seat in silver grey striped velour. 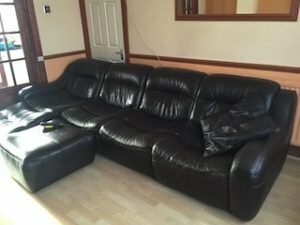 A five seater high back right hand corner sofa and matching square footstool, upholstered in black faux leather. 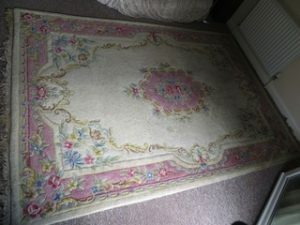 A large woollen shabby chic area rug, decorated with a pink and gold floral motif against a cream ground. 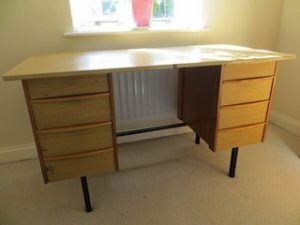 A solid wood retro style desk on black legs, having four drawers to either side. 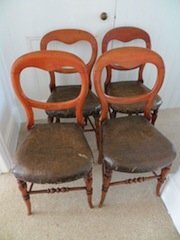 A set of four solid wood spoon back dining chairs, upholstered to the seats in chocolate brown authentic leather. 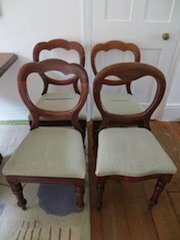 A set of four solid wood dining chairs, upholstered to the seats in pale green velour. 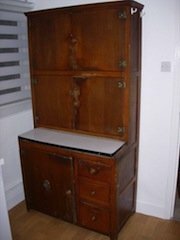 A tall standing solid wood vintage dresser, having two double cupboards above a small cupboard and three drawers. A vintage curved back mahogany based armchair, upholstered in green and red floral patterned fabric. A hand painted white curved back Lloyd Loom armchair, upholstered to the seat in grey cotton fabric. 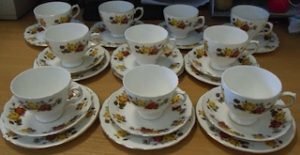 A collection of floral patterned Coclough fine bone China teacups, saucers and side plates. An antique high back armchair on a solid mahogany base, upholstered in green and red tartan patterned fabric. 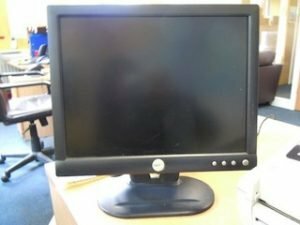 A black 17 inch Dell E152FPB computer monitor. A solid oak heavily carved high back armchair, upholstered in red and yellow daisy patterned fabric. A tall standing hand painted cream heavily carved mirror inlaid wardrobe, in the shabby chic style. 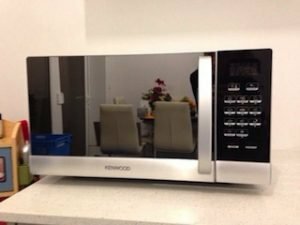 A black and stainless steel mirror fronted Kenwood large capacity microwave. 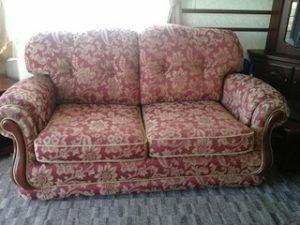 A two seater high back vintage sofa inlaid with solid wood, upholstered in cream and red floral patterned fabric. 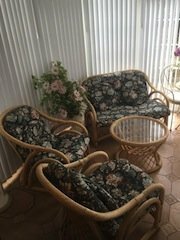 A four piece cane conservatory sofa suite, to include a two seater high back sofa, two armchairs and a glass topped coffee table. A white under counter Indesit 7kg 1400 spin washing machine.